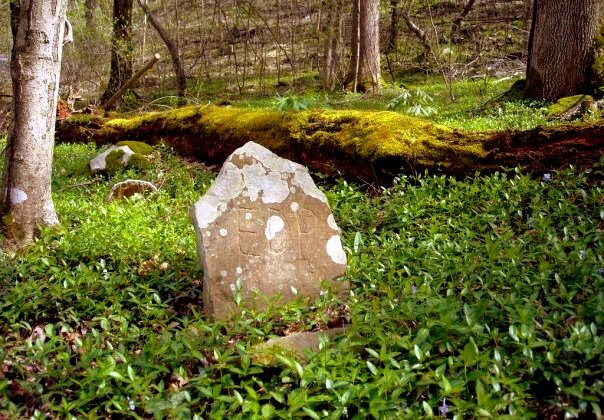 Periwinkle surrounds a primitive headstone on a grave near Grandview, West Virginia (WV). Strolling through a country cemetery, historian David Rotenizer spies something he’s been looking for in the grass. “Just as I suspected,” he says, crouching down. “Periwinkle!” He parts the clippings and blades with his fingers, revealing a thicker, darker leaf and a tiny pink flower. Old-timers had a system of managing cemeteries, he explains. They planted periwinkle (Vinca minor) as a ground cover. Along with shade trees, it kept briers and grass at bay, and the trees helped the shade-loving periwinkle thrive. “Then new generations cut down the trees, and the periwinkle died back, and the grass and brush took over, and that’s when maintenance issues began,” he said. Rotenizer, now tourism director for Franklin County, Va., may routinely engage in multi-million dollar economic initiatives, but his heart still lingers in country cemeteries in the West Virginia hills. 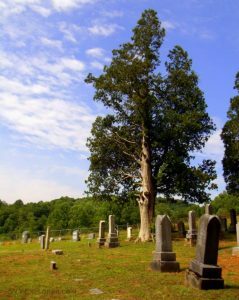 Rotenizer also recommends that cemetery boards and foundations invest in traditional deciduous shade trees, which lose their leaves in winter, and in ornamental evergreens, all of which were common in now-historic cemeteries and graveyards. “Trees were actually introduced into cemeteries, especially the cedar,” he said, the origins of which are old-world, and, like the periwinkle, the cedar was believed by some to possess supernatural properties. Yucca is another commonly introduced plant that can be used to help locate cemeteries, and exotic plants can also lead cemetery hunters to locate burials. “Keep an eye out for additional planting that seem out-of-character for the area. If families of the deceased knew that the person liked an exotic plant type, it may have survived. You never know,” he said. Rotenizer cautions that cemetery committees should proceed carefully when it comes to restoring burial grounds. “I encourage boards and cemetery groups to not engage in projects unless they have done due diligence researching and understanding the best practices for cemetery preservation projects. It is very easy to do more long-term harm than good,” he says. Committees should also be careful to keep records, he says, and share them with historical societies and commissions. Rotenizer say the Association for Gravestone Studies is an ideal resource for cemetery preservation. The Preservation Alliance of West Virginia is also an important state organization that occasionally offers training opportunities and may be aware of restoration training elsewhere. Previous articleAirBnB to support furloughed federal employees in W.Va.